I am quite sure that most of you would love to have a device that allows you to stream videos, music from one small device to a much larger and a better one. And if you are the one with such a wish then EasyCast OTA HDMI 1080P TV Stick is the gadget that you should be looking for. In the modern day, where most of the families posses multiple smart devices, it is always a good option to enjoy things on a much larger and a common space via casting it. Now, the question that arises is how is this, the correct option for you? Well, I would not say that this is the one and all perfect device for you and you will not be able to enjoy your smart devices without the EasyCast OTA HDMI 1080P TV Stick. But what I will certainly put forward to you is that with the TV Stick, you will have a much better quality enjoyment at ease. Just think of a situation where you and your brother are playing a multiplayer pool game via your smartphones. Would it not be great if you could cast it to your Android Smart TV and have a single screen to look forward to while staying intensely immersed in the game? That would be awesome for sure. Now, just imagine another situation where you have the trailer of any much awaited movie and you want to share it with your family. Instead of going one by one, all you need is to connect to the EasyCast OTA HDMI 1080P TV Stick and here you go. You can watch movies; streaming your favorite playlist, etc. via the TV Stick at ease. But before you decide to buy it, I would just suggest that you take a sneak at the features that it provides. It supports DLNA, Miracast, EZAir (Airpaly), multi-screen interactive by pushing only one button. The WiFi display dongle receiver applies to LCD, TV and Projector with HDMI interface sharing picture, video, music on any iOS, Android or Windows based device. It supports HDMI 1.4, 1080P full HD output. It supports a WiFi 802.11 b/g/n wireless connectivity and strong anti-jamming capability coupled with the ability to upgrade OTA online. The point to be noted is that the TV Stick provides all the facilities that you need to have in order to get along with sharing your stuff and pleasure with your family. The even better part is the minimal price tag it has. To be true, compared to the other devices in the market at present, EasyCast OTA HDMI 1080P TV Stick provides literally all the major functions with no loss of quality. 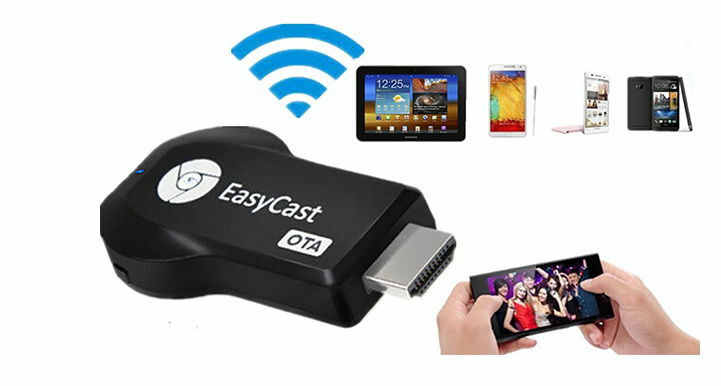 It is quite obvious that you might just have some confusion with regards to compatibility with various other devices, but gladly the EasyCast OTA HDMI 1080P TV Stick supports all the major devices provided they support Miracast, DLNA or AirPlay.